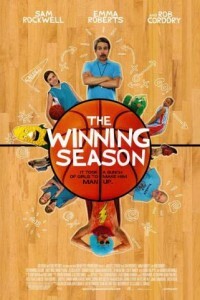 From director James C. Strouse (the movie box office bomb “Grace is Gone”) comes the big screen movie “The Winning Season” starring Sam Rockwell as an adult misfit who is brought on to coach the local girl’s high school basketball team. “The Winning Season” costars Emma Roberts, (niece of Oscar winner Julia Roberts) and also stars Rob Corddry. Why movie studios make movies that will never make money will never cease to amaze us. And Eddie The Eagle is another one of those movies.